Providing you the best range of phe air to air, plate type heat exchanger air to air, energy recovery systems and air to air cross flow plate heat exchanger phe with effective & timely delivery. Cross-flow heat exchanger The cross-flow heat exchanger is built from aluminum plates. Plates in special version are additionally covered with a layer of epoxy resin, between which supplying and returning air flows (streams are either cross-flow or separated from each other). Discharged air flows through some of ducts between the plates heating them, while the fresh air flows through remaining ducts, drawing heat from heated plates. 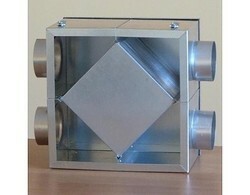 Advantages of cross-flow heat exchanger are its simple design, no moving parts and system tightness. 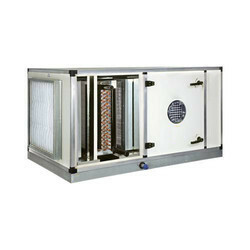 Heat exchangers reaches efficiency of 55 to 70%. 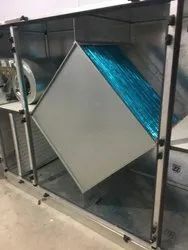 Additionally, the exchanger can be equipped with a by-pass damper, which allows air to be redirected outside the operational part of the exchanger if there is no need for heat recovery. It also serves as freezing protection for exchangers. The droplet separator is installed on the discharge side of the exchanger, which removes condensation of the airstream. The dehum energy recovery solution is installed with no interference and offers a rapid return on investment in as little as 9 months. A standard desiccant dehumidifier will use between 1.2 to 1.4kW of energy to remove 1kg of moisture from the air. In a typical existing installation, around 90% of the rated energy input to the machine is for the regeneration heater. Here at dehum we have developed a unique way of reclaiming what was waste energy in the process to achieve a proven result of less than 0.9kW of energy per kg of water removal. These results have provided energy savings of around 35% on currently installed equipment. Using our bespoke solution, we can recover around 60% of previously wasted energy, which is then used to pre-heat the incoming air stream, reducing the load on the regeneration heater.¿¿This leads to direct energy savings. The actual ROI depends on the costs of the energy recovery system and the installation requirements, which are site-specific. A survey can be requested which will be undertaken and a suitable return on investment calculated for your actual installation. PCS Boards is a Wigan-based manufacturer of high-quality insulation materials to meet all requirements for standard and bespoke products for the building trades. Their manufacturing processes include the need to dehumidify air to a high standard to maintain product quality and consistency. An industrial dehumidifier of the type they use in their process uses electricity to regenerate a rotor in a machine, where moisture is captured and has to be removed. These machines, as supplied by dehum, use around 90% of their rated energy to remove the moisture from the machine and as such can be very energy intensive. PCS already had an installation and called on dehum to address the running costs of the machine to assist in profitability and efficiency. The dehumidification process and regeneration of the rotor in these machines result in a hot wet air stream being discharged to the atmosphere. 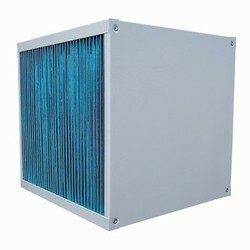 In a well-designed system, this can be up to 700C and contains useful energy for simple recovery. The application of bespoke energy recovery system can easily recover 70% of the 'lost energy' and divert it to the inlet on the machine, leading directly to energy cost savings of 30% or more.